The weather's "fat controller" finally decided to make a move in the third week of June, I am talking, of course, about the line of the jet stream that affects the UK, when it finally decided to change position and settled across the north of Scotland. Immediately our weather started improving, so much so that by the end of the second week of July the shade temperature in the village in the mid afternoon of Saturday 13th was 27.5ᵒC or 81.5ᵒ Fahrenheit. In other parts of the country the temperature reached 31.4ᵒC or 88.5ᵒF giving the hottest day of the year at that time and the forecast was for more to come. Jet streams are high speed winds circulating in an undulating pattern at altitudes of between 9 and 16 kilometres in a west to easterly direction. There are two polar jet streams, one in each hemisphere and they are caused by the temperature differential between polar and equatorial regions. They also occur on other planets most noticeably Jupiter which has multiple jet streams that are responsible for the coloured bands around the planet. This year our northern jet stream has wobbled off its normal course resulting in the topsy-turvey weather conditions across the USA and Europe. Reports this month have included one from Carolyn Last in which she said she was faced with the conundrum of who or what was eating the leaves of her drooping white mulberry. After considering the options the blame has settled on the grey squirrel as being the most likely culprit although this problem has not occurred in the past. Paul Pitts described two incidents. The first concerned the sighting of a weasel in the garden and further investigation suggested that it had made a home under the floor of the garage. His second account was about the very unusual behaviour of a moorhen on his garden pond. He was standing quietly looking across the pond for the one moorhen chick remaining from a litter of six- the others probably taken by a fox - when to his utter amazement the head of an adult moorhen suddenly emerged from the water for a few seconds and then slowly sank back down again out of view. He stood waiting for a while, shaking his head in disbelief when once again the bird's head appeared and the process repeated. He made some enquiries and it transpires that moorhens adopt this strange behaviour when the feel under threat. 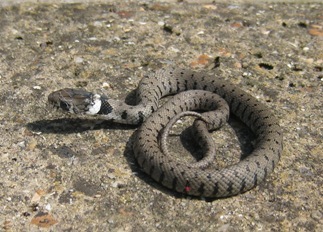 Our own garden pond does not have resident moorhen but a young grass snake decided to cool off in the pond last weekend. The last item of news comes from Rod Dorgan who noticed that many of the sycamore seeds on a tree, next to the road on Outwood Common were not only the normal combination of two winged seeds joined in a pair but, very unusually, there were also threesomes and foursomes. The seeds of sycamore (Acer platanus) are known individually as samaras and when two seeds are joined as double samaras - colloquially they are known as keys, whirlygigs, spinning jennies or helicopters depending on which part of the country you are from. It is believed that the sycamore or giant maple originated in North America and grows to approximately 20 - 25 metres. The timber was traditionally used for kitchen ware such as chopping boards due to the whiteness and close grain and in Wales the wood was used to make "love spoons" for newly married couples.